Proterozoic pegmatite swarm in the headwall of the cirque of a small mountain glacier, northeastern Baffin Island, Nunavut. A pegmatite is a holocrystalline, intrusive igneous rock composed of interlocking phaneritic crystals usually larger than 2.5 cm in size (1 inch); such rocks are referred to as pegmatitic. The word pegmatite derives from Homeric Greek, πεγνυμι (pegnymi), which means “to bind together”, in reference to the intertwined crystals of quartz and feldspar in the texture known as graphic granite. Most pegmatites are composed of quartz, feldspar and mica, having a similar basic composition as granite. Rarer intermediate composition and mafic pegmatites containing amphibole, Ca-plagioclase feldspar, pyroxene, feldspathoids and other unusual minerals are known, found in recrystallised zones and apophyses associated with large layered intrusions. Crystal size is the most striking feature of pegmatites, with crystals usually over 5 cm in size. Individual crystals over 10 metres (33 ft) long have been found, and many of the world's largest crystals were found within pegmatites. These include, spodumene, microcline, beryl, and tourmaline. Similarly, crystal texture and form within pegmatitic rock may be taken to extreme size and perfection. Feldspar within a pegmatite may display exaggerated and perfect twinning, exsolution lamellae, and when affected by hydrous crystallization, macroscale graphic texture is known, with feldspar and quartz intergrown. Perthite feldspar within a pegmatite often shows gigantic perthitic texture visible to the naked eye. The single feature that is diagnostic to all pegmatites is their large size crystal components. Pegmatite bodies are usually of minor size compared to typical intrusive rock bodies. Pegmatite body size is on the order of magnitude of one to a few hundred meters. 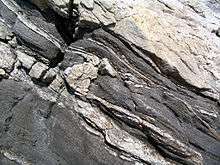 Compared to typical igneous rocks they are rather inhomogeneous and may show zones with different mineral assemblages. Crystal size and mineral assemblages are usually oriented parallel to the wall rock or even concentric for pegmatite lenses. Metasomatic pegmatite, in a few cases, could be explained by the action of hot alteration fluids upon a rock mass, with bulk chemical and textural change. Pegmatitic granite, Rock Creek Canyon, eastern Sierra Nevada, California. Note pink potassium feldspars and cumulate-filled chamber. The mineralogy of a pegmatite is in most cases dominated by some form of feldspar, often with mica and usually with quartz, being altogether "granitic" in character. Beyond that, pegmatite may include most minerals associated with granite and granite-associated hydrothermal systems, granite-associated mineralisation styles, for example greisens, and somewhat with skarn associated mineralisation. It is however impossible to quantify the mineralogy of pegmatite in simple terms because of their varied mineralogy and difficulty in estimating the modal abundance of mineral species which are of only a trace amount. This is because of the difficulty in counting and sampling mineral grains in a rock which may have crystals from centimeters to meters across. Garnet, commonly almandine or spessartine, is a common mineral within pegmatites intruding mafic and carbonate-bearing sequences. Pegmatites associated with granitic domes within the Archaean Yilgarn Craton intruding ultramafic and mafic rocks contain red, orange and brown almandine garnet. Syenite pegmatites are quartz depleted and contain large feldspathoid crystals instead. Pegmatite is difficult to sample representatively due to the large size of the constituent mineral crystals. Often, bulk samples of some 50–60 kg of rock must be crushed to obtain a meaningful and repeatable result. Hence, pegmatite is often characterised by sampling the individual minerals which comprise the pegmatite, and comparisons are made according to mineral chemistry. Geochemically, pegmatites typically have major element compositions approximating "granite", however, when found in association with granitic plutons it is likely that a pegmatite dike will have a different trace element composition with greater enrichment in large-ion lithophile (incompatible) elements, boron, beryllium, aluminium, potassium and lithium, uranium, thorium, cesium, et cetera. Occasionally, enrichment in the unusual trace elements will result in crystallisation of equally unusual and rare minerals such as beryl, tourmaline, columbite, tantalite, zinnwaldite and so forth. In most cases, there is no particular genetic significance to the presence of rare mineralogy within a pegmatite, however it is possible to see some causative and genetic links between, say, tourmaline-bearing granite dikes and tourmaline-bearing pegmatites within the area of influence of a composite granite intrusion (Mount Isa Inlier, Queensland, Australia). Pegmatites are important because they often contain rare earth minerals and gemstones, such as aquamarine, tourmaline, topaz, fluorite, apatite and corundum, often along with tin and tungsten minerals, among others. 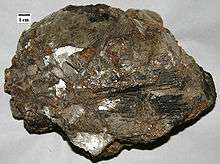 Pegmatites are the primary source of lithium either as spodumene, lithiophyllite or usually from lepidolite. The primary source for caesium is pollucite, a mineral from a zoned pegmatite. The majority of the world's beryllium is sourced from non-gem quality beryl within pegmatite. Tantalum, niobium, rare-earth elements are sourced from a few pegmatites worldwide, notably the Greenbushes Pegmatite. Bismuth, molybdenum and tin have been won from pegmatite, but this is not yet an important source of these metals. Pegmatites can be classified according to the elements or mineral of interest, for instance "lithian pegmatite" to describe a Li-bearing or Li-mineral bearing pegmatite, or "boron pegmatite" for those containing tourmaline. There is often no meaningful way to distinguish pegmatites according to chemistry due to the difficulty of obtaining a representative sample, but often groups of pegmatites can be distinguished on contact textures, orientation, accessory minerals and timing. These may be named formally or informally as a class of intrusive rock or within a larger igneous association. While difficult to be certain of derivation of pegmatite in the strictest sense, often pegmatites are referred to as "metamorphic", "granitic" or "metasomatic", based on the interpretations of the investigating geologist. Rocks with similar texture to pegmatites are called pegmatitic. Pegmatite (light colored) in dark mica schist, Île de Noirmoutier, France. Pegmatite (pink), Isle of Skye, Scotland. Worldwide, notable pegmatite occurrences are within the major cratons, and within greenschist-facies metamorphic belts. However, pegmatite localities are only well recorded when economic mineralisation is found. Aplite and porphyry dikes and veins may intrude pegmatites and wall rocks adjacent to intrusions, creating a confused sequence of felsic intrusive apophyses (thin branches or offshoots of igneous bodies) within the aureole of some granites. ↑ London, David; Morgan, George B. (2012-08-01). "The Pegmatite Puzzle". Elements. 8 (4): 263–268. doi:10.2113/gselements.8.4.263. ISSN 1811-5209. ↑ Schwartz, G. (1928). "The Black Hills Mineral Region". American Mineralogist. 13: 56–63. ↑ London, D.; Kontak, D. J. (3 September 2012). "Granitic Pegmatites: Scientific Wonders and Economic Bonanzas". Elements. 8 (4): 257–261. doi:10.2113/gselements.8.4.257. London, D. (2008): Pegmatites. Canadian Mineralogist Special Publication 10, 347 pp.